Becoming one of the very best hair salons in Houston, Texas doesn’t come easily. It was through lots of hard work and constant training that David and Luis reached the prestigious level of being the best hairstylists in Houston. Because they know what it takes to become experts at their craft, they focus on building their team in the same way and with the same attention to detail. 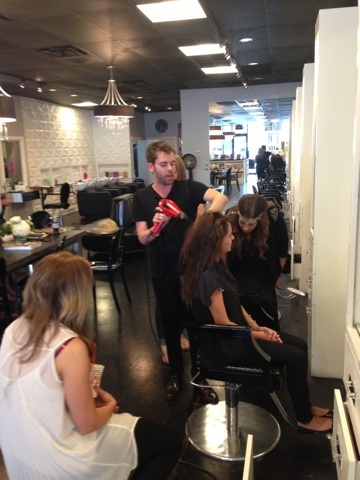 David and Luis have both trained rooms full of hairstylists in Houston and all over the country. With their background, it’s only natural for them to help talented stylists elevate their skills to become extraordinary stylists. This is how they’ve achieved their vision of creating a nationally recognized salon in Houston, Texas. A belief in paying it forward is why they personally provide hours of training in their weekly Therapy Academy in-salon classes. But it doesn’t stop with David and Luis. Sulieman Telfah, one of Therapy’s top level stylists, is also a Kerastase national trainer and you will find him teaching at Therapy Academy on advanced styling techniques for the best blowout. David says, “We love our team and we want our clients to come here and expect only the best so that’s why we always keep our pulse on the trends in hair and are constantly training our staff”.